Library News & Events | News from the UAA/APU Consortium Library's blogs, Facebook, YouTube, and other news outlets, combined for your convenience! It was easier to believe in solid ground before it became common knowledge that the Earth is a sphere with tectonic plates rafting over molten rock; unlike the popular myth, not even turtles go all the way down. It’s been nearly 4 months since the November 30th earthquake, yes, but also 55 years since the 1964 quake. There are those who have become hypersensitive to every slight jolt and quiver, whose home pages have changed — perhaps permanently — from the innocuous Kitten War to the Alaska aftershocks website, now measuring the anxieties of their lives not in coffee spoons, but in logarithmic fractions they never paid much attention to before. And why not? To my mind, this particular local zeitgeist was best captured by L. Juhnke 54 years ago. The Anchorage Times was the recorder of daily Anchorage history from 1916 to the day its doors closed in 1992 (joined in the late 1940s by the Anchorage Daily News), and one editorial page feature was called Poet’s Corner (or, depending on the day’s typesetter, Poets’ Corner, or just plain Poets Corner). On March 27th, 1965, exactly one year afterwards, Louise Juhnke’s poem March Jitters was published; it applies just as much to the aftermath of 2018 as to that of 1964. (A little further research in the Times database revealed L. to be Louise, a frequent poetry contributor.) For decades, the only way to find that poem would have been by looking at frame after frame of microfilm, or by choosing the right Times clippings notebook from among thousands. But as of last October — just in time for the November 30th earthquake, if anyone had known to look for it — March Jitters and the rest of the Anchorage Times became fully available online back to 1916 — amazing. Those thousands of clipping file notebooks were replaced by searchable full-page scans of the Times: a local historian’s dream for many decades. You’ll find plenty of Alaska earthquake books in the QE 535 call number area, but it was only in 2017 that the best popular book on the 1964 quake and how it changed the understanding of all earthquakes was published, The Great Quake by Henry Fountain (ALASKA QE535.2.U6 F65 2017). For photographs, a good place to look is Alaska’s Digital Archives (https://vilda.alaska.edu); I don’t see any for the November 30th earthquake yet, but it’s just a matter of time. For all of our own seismological woes, I still think from time to time of those poor people in Chile in 1960. (https://goo.gl/jfi6Y9) Our 2018 earthquake lasted up to a couple of minutes, depending on where you were; think the first two verses of Led Zeppelin’s Stairway To Heaven. The 1964 earthquake lasted about four and a half minutes; think a little over half of Stairway To Heaven, up to the words about the May Queen. But Chile? Think Stairway To Heaven, and then play the first two verses over again. Ten minutes is a heck of a lot of rock and roll. Most of our time this month went to working on multi-institutional topic guides and preparing for our session at the Alaska Library Association Conference in Juneau the first weekend of March, but we also released two podcasts, described some new collections, added photographs to Alaska’s Digital Archives, including our 20,000th item, and completed a new exhibit. Bruno Kroon papers; circa 1919-1920. HMC-1307. We received a 70MB addition to the Bruno Kroon papers. This addition contains digitized copies of letters written by Kroon to his family in the Netherlands. Since the letters are written in Dutch, Kroon’s great-niece Anja, who donated the collection, also provided us with translations of the letters. 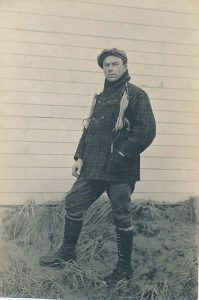 The letters were sent by Kroon while he was in Milton-Freewater and Union, Oregon, Seattle, Washington, and False Pass, Alaska. In the letters, Kroon discusses the weather, hunting, music, cost of living in Alaska, and his work pay. Alvin Doane photograph albums; circa 1942-1943. HMC-1311. Alvin Doane enlisted into the U.S. Army, and subsequently served with the 340th Engineer Regiment, which was involved in the construction of the Alaska Highway from 1942-1943. Alvin Doane died in 1987. 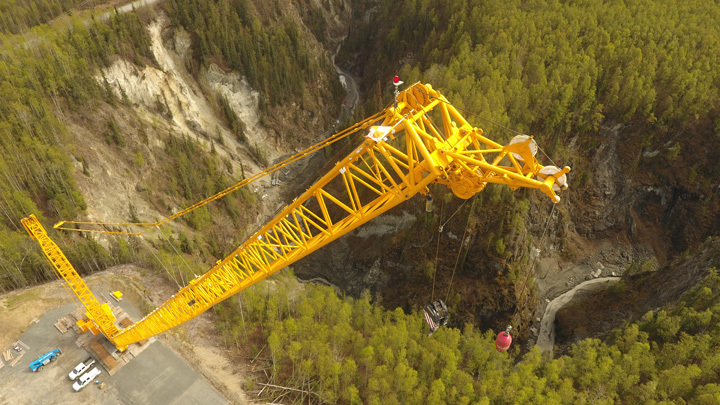 The collection contains two photograph albums with photographs taken and collected by Alvin Doane which depict the construction of the Alaska Highway. 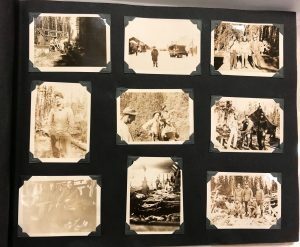 Subjects of the photographs include men working on the Alaska Highway, equipment and machinery, bunkhouses, tents, hunting and fishing, liquor stores, Whitehorse and Carcross, scenery, and Quonset huts. The collection also includes a pressed flower and a napkin from the White Pass and Yukon Route train. 15 images from Bruno Kroon papers. The photographs depict Kroon, canneries, people, and buildings in Morzhovoi Bay and King’s Cove, and Boca De Quadra, Alaska. 22 photographs from Charles V. Lucier papers. The photographs added to the Digital Archives from the Lucier papers were all taken in Sheshalik, 1952. Gordon Mitchell Sr. washing fish for his family’s supper. 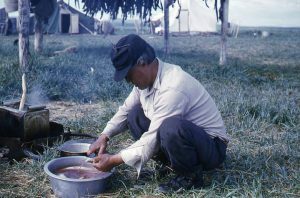 [Sheshalik] (Noatak camp) 1952. 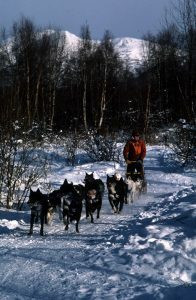 We also added our 20,oooth image to Alaska’s Digital Archives. 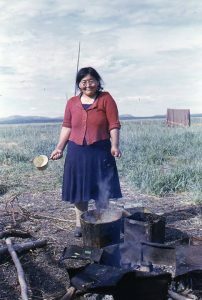 The photograph we chose, from the Charles V. Lucier papers, depicts Della Keats cooking beluga muktuk in Sheshalik, 1952. Della Keats was an Inupiat healer and the Della Keats Summer Research Program at University of Alaska Anchorage was named for her. 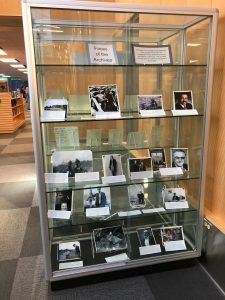 We also have a new exhibit on the first floor of the UAA/APU Consortium Library near the entrance to ARLIS. 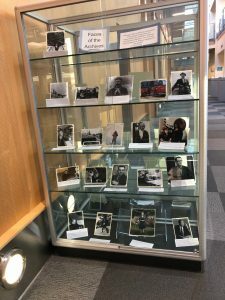 Our exhibit, titled “Faces of the Archives,” features photographs along with a brief biographical note of the people whose lives are represented in our holdings. The post New in the Archives: February 2019 appeared first on Archives and Special Collections.